Charming sophisticated and elegant embroidered bride tote bag for weekend travel. Perfect for destination beach weddings or vacation. High quality finishing, micro fiber linen body with sateen bottom band and trim. Covered corded handles. Choose a matching weekend tote or cosmetic bag for a complete travel set. 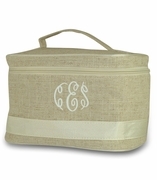 Bride tote bag measures 20"W x 15"H, eight inches across bottom. Supported bottom, padded side walls, zipper closure and detachable cross body shoulder strap. I LOVE the bags I received as MOH/Bridesmaids gifts. The product is perfect and made very well. I also loved working with Simply Bags. The product I originally ordered was out of stock - so they personally called me and worked with me to find another bag, that I actually like better now! The customer service was great - oh and I received the bags within a few days! Even better! Thanks so much, Simply Bags!